Previously the question post only provided students with a short answer response to a question. 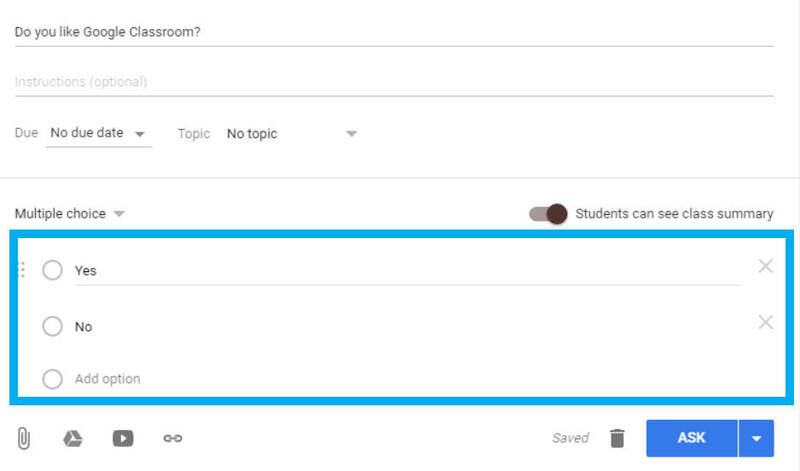 Now the Question post allows the teacher to choose whether to pose a short answer question or to poll the students and a single multiple choice question. Whether it is a pre-planned vote or a spur-of-the-moment concept check, these questions provide a fast method of receiving student feedback. In the Question post, there is now a drop-down menu to select between Short answer and Multiple choice. Once multiple choice is selected, options fields will appear below for what the students can select. Once the question is complete, students will be able to answer the multiple choice question directly in the Stream. By default, students will be able to see how many students selected which option from the shaded bars that appear in the background of each option.